In addition, this version comes with a black polyurethane (PU) faux leather cover, whose gorgeous design has been inspired by race car seats. All Nitro Concepts chair series from the Carbon Class feature a PVC back side covering with an eponymous carbon look. 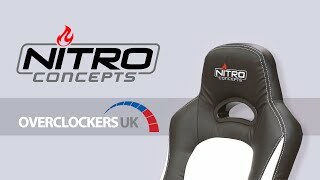 The whole package is being completed by subtle white seams and a Nitro Concepts logo that adorns the headrest. As an added bonus, a little metal plate with logo lettering is included with every unit to allow you to proudly proclaim your ownership of a Nitro Concepts gaming chair. More links for "C80 Pure Series Gaming Chair - Black/White"
Grab some stress relief and a change of clothes. Putting this together on my own, was the most stressful experience I think I have ever had, putting an item together. I initially thought that the reviews were exaggerating, boy was I wrong. Try and find someone to help. Use better tools if you can. When inserting screws for base and back, leave all partially untightened, so you are able to line the holes up easier. In terms of build quality, it is acceptable. There are imperfections in the materials, scratches and screws holes don't match. You are also likely to scratch it even more while building it. Sitting comfort seems good initially, I have never owned a chair of this style, so it may take some getting used to. There seems to be a lot more lower back support than any other chair I have previously used. Arm rests comfortable, the padding has a nice thickness that feels just soft enough. The base of the chair is equally comfortable, while being wide enough to spread your legs (you may require the wider model if you have a big frame. The rolling motion of the wheels feels good on carpet, with not to much resistance. The height and tilt adjustment is also smooth, with the tilt force being adjustable. I am in to minds about the price, I paid £120~. compared to other chairs of this design, it is cheaper, but this clearly comes with some drawbacks. I think, only due to it being comfortable, that I would recommend this product, if you are on a budget. I have not herd of build quality issues on more expensive chairs by other manufacturers, so if you don't want the stress and have the money, maybe go for them. After sitting in one of these at VR World Congress, I purchased one straight away because they were so comfortable. For around £130 these chairs are incredible value for money! I absolutely love it and will be recommending it to all of my friends. THBD416G3000HC16CDC01, 3000MHz RAM Speed, CAS 16-18-18-36 Timings, 1.25-1.35v VDIMM, Lifetime Warranty with OcUK.